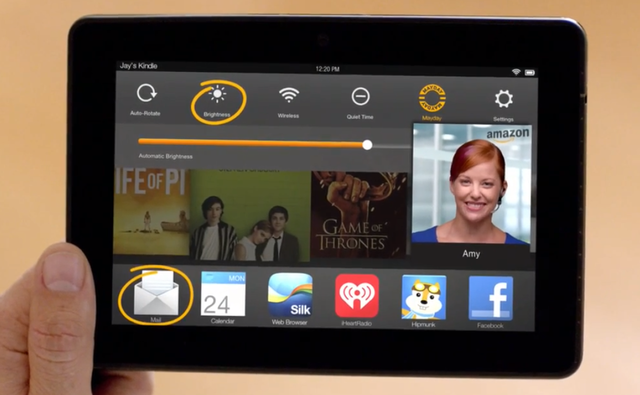 Amazon’s new tech support system, Mayday, has been marketed as a major selling point for the online retailer’s Kindle Fire HDX tablet. Since Mayday functions as a live and fast tech support system, response time is crucial in order for consumers to be happy with the way that it works. Prior to the holidays, Mayday would connect a user with an Amazon employee within 15 seconds but during Christmas, that response time was decreased to just nine seconds. Mayday is completely free and since it is also available all day long, it seems to be a sign of what is to come in the tech support world. While normal tech support systems allow a user to call-in and ask questions, Mayday gives an Amazon employee control over parts of the device in question, making it far more effective than just a phone call. Along with rolling out the faster Mayday response times, Amazon released a couple of its favorite support calls from over the Christmas break. A young girl got a Kindle Fire HDX for Christmas. She was playing around with it and accidentally tapped the Mayday button–when she saw the Tech Advisor, she just screamed “MOOOOOOMMM!”, not having expected a person to pop up on the screen. Her parents could be heard laughing in the background. A customer put a picture of their Christmas tree and their stockings hung in front of the fireplace on their Fire HDX display, and called in to wish the Tech Advisors a Merry Christmas. Amazon met quite a few of its goals this December. Not only did it improve Mayday but it was also able to sell 1 million Prime memberships which are generally sold to customers who are looking to receive faster shipping without having to pay for it. As effective as Mayday might be, live video tech support will definitely shine once it is applied to business software applications that are more difficult to understand.